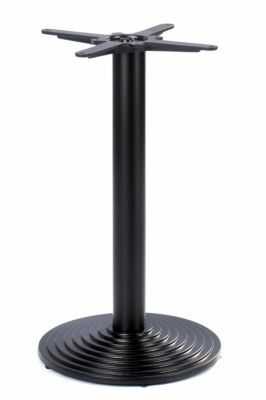 Cafe table base with a round stepped foot, in a durable powder coated Black finish. Suitable for use with table tops 800mm round or 700mm square. This item is popular for use in cafes, restaurants and hotels. Circular stepped cast iron base in a black finish. These café table bases can be used in conjunction with the comprehensive selection of table tops from our café table top section. These bases are delivered flat packed and are easily assembled.